Specialty acrylate, isononyl acrylate is derived from the chemical reaction of isononyl alcohol and acrylic acid. Research indicates that isononyl acrylate has the least glass transition temperature as compared to other acrylates. This makes them the ideal raw material for adhesives and sealants. The low glass transition temperature of isononyl acrylate also changes the rheological properties of elastic paints, thus making it a key ingredient in the production of paints and coatings. Owing to these reasons, the global isononyl acrylate market is expected to surge at a CAGR of 2.4% between 2016 and 2024. The global market is expected to reach a valuation of US$12.3 mn by the end of 2024 from US$10 mn in 2015. The four types of commercialized acrylates are methyl acrylate, ethyl acrylate, butyl acrylate, and 2-ethylhexyl acrylate (2-EHA). The global isononyl acrylate market is expected to thrive due to the flourishing global adhesives industry. The report indicates that the global adhesives and sealants industry is expected to expand at a CAGR of 4.5% between 2016 and 2024, whereas the global adhesives tapes industry is anticipated to rise at a CAGR of 6.8% during the same period. Both of these factors are expected to spike up the demand for isononyl acrylate in the coming years. Isononyl acrylate is primarily employed for adhesives applications due to their low glass transition temperature. On the basis of application, the global isononyl acrylate market is segmented into adhesives and sealants and paints and coatings. Needless to say, the adhesives and sealants application segment is anticipated to expand at a phenomenal pace. This segment is also poised to acquire a share of 96.4% by the end 2024. Currently, the key application of isononyl acrylate is seen in the production of pressure-sensitive adhesive tapes. Thus, the rise in demand for these tapes is expected to have a positive influence on the demand for isononyl acrylate in the near future. Paints and coatings industry is also anticipated to offer lucrative opportunities to the overall market due to the growing demand for these in the booming construction industry. In terms of geography, the global isononyl acrylate market is segmented into North America, Asia Pacific, Europe, Latin America, and the Middle East and Africa. Of these regions, Asia Pacific holds a dominant share in the global market. 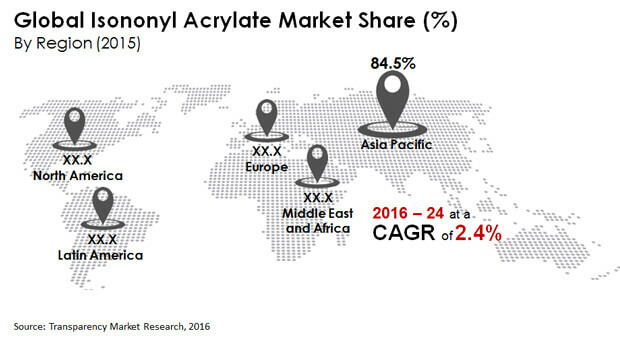 The Asia Pacific isononyl acrylate market held a share of over 80% in the overall market in 2015. The rapid industrialization and growing manufacturing activities are expected to drive the regional market in the coming years. The emerging economies of India and China are anticipated to be key consumers of isononyl acrylate during the forecast period. Analysts anticipate that North America will also open up several incredible growth opportunities to the overall market in the coming years. The escalating demand for pressure-sensitive tapes in North America is expected to be the key growth driver for the regional market. On the other hand, the steady growth of the Europe paints and coatings industry is expected to hinder the uptake of isononyl acrylate in the coming years. Regions such as the Middle East and Africa and Latin America are also expected to remain sluggish during the forecast period. The key players operating in the global isononyl acrylate market are BOC Sciences, Osaka Organic Chemical Industry Ltd, and Angene International Limited. The competitive landscape of the overall market is quite consolidated since due to the presence of few players. Isononyl acrylate is a specialty type of acrylate, which is obtained by the reaction of acrylic acid and isononyl alcohol. Laboratory practices have concluded that isononyl acrylate has the minimum glass transition temperature, amongst all commercially available acrylates. Rising demand for isononyl acrylate in the adhesives industry in various regions is likely to propel the isononyl acrylate market in the near future. Isononyl acrylate is also used in paints & coatings application owing to its thermal properties such as low glass transition temperature. Demand for isononyl acrylate is projected to increase in the next few years considering the growth of the global pressure sensitive adhesives market. Asia Pacific dominates the isononyl acrylate market in terms of production and demand. Japan is expected to be the key manufacturer and consumer of isononyl acrylate. Europe is the second largest consuming region. Availability of inexpensive substitutes such as 2EHA, butyl acrylate, methyl acrylate and ethyl acrylate is expected to hamper the isononyl acrylate market in the forecast period. Furthermore, the long lead time fo synthesizing isononyl acrylate is also expected to hamper the growth of isononyl acrylate during the forecast period. The report includes detailed value chain analysis, which provides a comprehensive view of the global isononyl acrylate market. Porter’s Five Forces model for the isononyl acrylate market has also been included to help understand the competitive landscape in the market. The study encompasses market attractiveness analysis, wherein end-users are benchmarked based on their market size, growth rate, and general attractiveness. Secondary research sources that are typically referred to include, but are not limited to company websites, annual reports, financial reports, broker reports, investor presentations, SEC filings, Plastemart magazine, Coatings magazine, BP magazine, U.S. Patents, Institute of Sciences, FAO, internal and external proprietary databases, and relevant patent and regulatory databases such as ICIS, Hoover’s, oneSOURCE, Factiva and Bloomberg, national government documents, statistical databases, trade journals, market reports, news articles, press releases, and webcasts specific to companies operating in the market.